Fun approx. 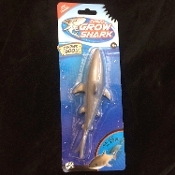 7-inch (17.5cm) long Jumbo Grow Shark grows up to 600% of original size. Once they dry out, they shrink back to the original size, so you can grow them again. Perfect for Halloween prop mad scientist laboratory, Sharknado movie night, safari jungle decor, luau pirate theme decorations, fun science study projects, school classroom prize boxes, birthday party favors, trick-or-treat giveaways and gag gifts. Fun prank to put in your bathtub! Jumbo Grow Shark Creature Magic Growing Aquatic Animal, as pictured. Fill a large container with ROOM TEMPERATURE water. Note: Make sure there is plenty of room in the container for your Jumbo Grow Shark to expand. Place the Shark in water, Results are NOT immediately noticeable, so be patient! For best results, let your Shark soak in the water for at least 72 hours (3 days), adding water as needed. Maximum growth will take about 1 week, depending on the time in the water and size of the container. If you carefully remove your shark from water and dry out on waxy paper, it will slowly shrink in size, so it can be used again! Starting size approx. 7-inch long (17.5cm) x 2.5-inch (6.25cm) wide x 1.5-inch (3.75cm) high.